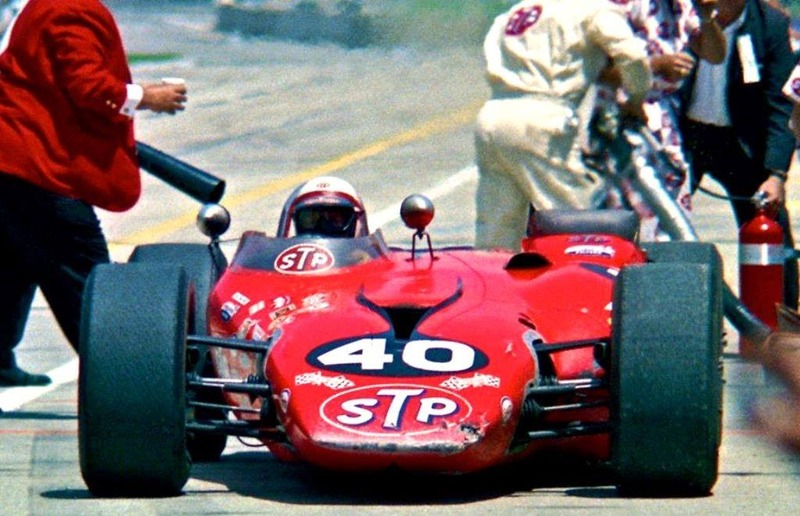 We all know the story of the Pratt & Whitney STP-Paxton turbine car, affectionately known as Silent Sam, driven by Parnelli Jones that came within three laps of winning the 1967 Indianapolis 500 after dominating most of the month. It was a beast and although it qualified relatively poorly (sixth), it dominated on Race Day until an inexpensive bearing in the gearbox sidelined it on Lap 197. What many don’t realize or remember is that Jones’ day was almost done barely more than a quarter of the way through the race. On Lap 52, Jones took his turbine-powered machine to the inside of Turn Four to lap LeeRoy Yarbrough. Whether or not Yarbrough knew he was there is debatable. What is not debatable is that Yarbrough came down onto Jones, causing their wheels to touch sending both cars into a spin. Neither car sustained any obvious damage and both were able to continue. But one thing I’ve always wondered was whether or not the bearing in the gearbox suffered unexpected damage that didn’t show up until the race was almost done. For those of you that take part in social media, I will highly recommend a Facebook page that you need to follow – Indiana Racing Memorial Association (IRMA). There you will see old photos of races from yesteryear. Some will look familiar, while some are so rare you’ll know you’ve never seen them before. Over the weekend, these two photos were posted to this page. The black & white photo shows the spin and how the car of Parnelli Jones is obviously pointed in the wrong direction. The color photo shows the nose of Jones’ car in a late race pit-stop. You can clearly see damage to the nose of the car, most certainly suffered in the spin on Lap 52. My question is this – did the spin cause the damage to the bearing in the gearbox that failed late in the race? During the spin, Silent Sam, spent a very short time rolling backwards, probably at a speed in excess of 100 mph. Someone asked the very question that I had wondered for years, if this spin caused the gearbox to fail. I was glad I wasn’t the only one that had wondered that. I am not an engineer by any stretch of the imagination. Both of my brothers are, but I didn’t get that gene. There is nothing in my DNA that would even remotely cause me to be mistaken for an engineer. You would think I would’ve asked them this question, but I didn’t. It was a very busy weekend. Even though I’m not an engineer, I know that a 500-mile race puts a great deal of stress on the various parts of a race car. Some pieces can take just so much before they fail, as we saw when the front suspension collapsed underneath James Hinchcliffe as he headed into Turn Three at Indianapolis in 2015. It almost cost him his life. I also know that a spin can put undue stress on different parts, especially when the car is rolling backwards at speed. I’m assuming the clutch was disengaged at that point…or was it? I’ve never been in a spinning race car so I don’t know. But I do know that it can be very hard on an engine to spin backwards with the clutch still engaged. Can I not assume that for the gearbox as well? I established long ago that I am not a gearhead. I think Donald Davidson has more mechanical aptitude than I do, and he freely admits he has none. I can point out a gearbox on an Indy car, but if you were to open one up, I couldn’t identify much at all, except for…well, the gears. So I’m speaking way out of my league, here. But I know many of you that read this site are very mechanically inclined. I also know that some current crew guys read this site occasionally, so maybe some of them can answer a question that has puzzled me for decades. Down below, I’ve also included a short six-minute video about the 1967 race, narrated by the great Tom Carnegie. At the 2:49 mark, is a clip of the fairly innocent looking spin. You can see that the car goes backwards near the end of the spin. Were these two seconds enough to cause fatal damage to the turbine’s gearbox? At the end of the video, Andy Granatelli doesn’t seem to think so. He blamed it on the builder of the gearbox. So help me out. 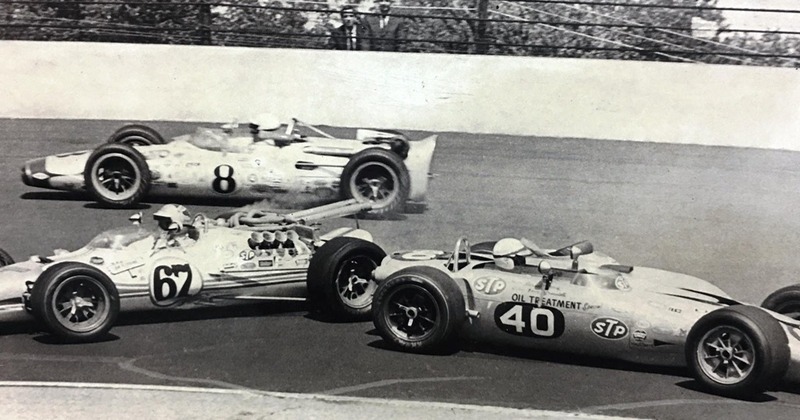 Could the spin caused by LeeRoy Yarbrough be the culprit that ended Parnelli Jones’ second trip to Victory Lane in four years just three laps short? Or are the two completely unrelated? Whatever the case, it’s given me a chance to showcase the Indianapolis 500, Parnelli Jones, Andy Granatelli and Tom Carnegie in mid-November. Any time I can do that, I’m happy. This entry was posted on November 13, 2017 at 4:02 am and is filed under IndyCar. You can follow any responses to this entry through the RSS 2.0 feed. You can leave a response, or trackback from your own site. George, as you indicated I (along with your other brother) AM an engineer, and my answer is, I doubt it, but without looking at the drawings or at least a picture of the gearbox and the bearing it is impossible to know for sure. I seriously doubt that the engine (and the gearbox) ran backwards during the spin because a turbine engine running backwards or even slowing down significantly would “flame out” immediately. Gas turbines require a constant steady flow of air into their compressor section (remember the movie, Top Gun where Maverick flew through Ice Man’s jet wash and flamed out? That was very realistic as to what can happen). The video doesn’t show whether Parnelli had to restart the turbine after the spin and I don’t remember, but I don’t think so, and doubt that the car had self start capability. Jones was a seasoned driver and the backwards part of the spin was so late in the event that he probably had the clutch in by that point. The fact that Andy Granatelli had told the gearbox designer that he thought that bearing was too small is a pretty strong indication that it was simply a bad design. I always enjoy these posts looking back at some aspect of the Indy500. I will go along with what Jack Phillips posted above because I was not able to wrap my mind around triple integral calculus or differential equations at Purdue and was shown the door. George, I remember that race well as I was there in J stand both days (after marching in the pre-race ceremonies in my high school band). You may recall that Jones, and all the other cars ran two un-credited laps after the race was stopped, then two or three more laps the next day before the green flag dropped again. Simple math shows that that bearing lasted 200 laps, which normally would have been enough. I have heard that it as not so much a design flaw as it was an unintended consequence, since the gearbox was designed for a helicopter, i.e., to be run at a constant speed. It was not designed for varying rpm’s that the 500 required ( I doubt that Parnelli flat footed it around Indy ). The bearing failed because the oil pump in the transmission could not supply enough oil when the rpm’s were down causing premature wear and finally failure. I’m not saying this as any kind of expert, only that this what I have heard, but it seems to make sense. Foyt also predicted before the that Jones would suffer a gear box problem. Let’s build another one and find out! No clutch to disengage. Torque converter/automatic AWD. You are correct. Earlier, I had someone e-mail me a link to an article and diagram. Thanks for pointing that out.